For fans of Dragons Love Tacos comes a fun, silly picture book about some unexpected guests from space. Will the dragons receive it? Do you think they’ll reply? 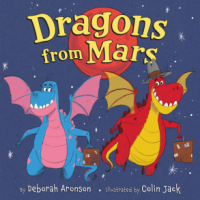 And what if the dragons decide to stop by. . . .
Dragons from Mars was such a beautifully illustrated story. I have never read a book illustrated by Colin Jack but I am absolutely in love with his style of art. The amount of detail that went in to each picture is simply amazing. No detail was overlooked, and you can see the amount of work that went in to each and every picture. This combined with the lyrical flow of the story really make this one stand out amongst all the dragon books out there. The rhyming was well done and made this book easy to read. It's a fun one to read aloud to your kids. Kids of any age will enjoy this. Especially with the amount of havoc they wreak when coming to Earth. A funny story with adorable pictures makes this story one that parents and children alike will love. Deborah and Colin work very well together and I can't wait to see more stories about Dragons!